LIC has launched one more new plan from 24th April 2017. 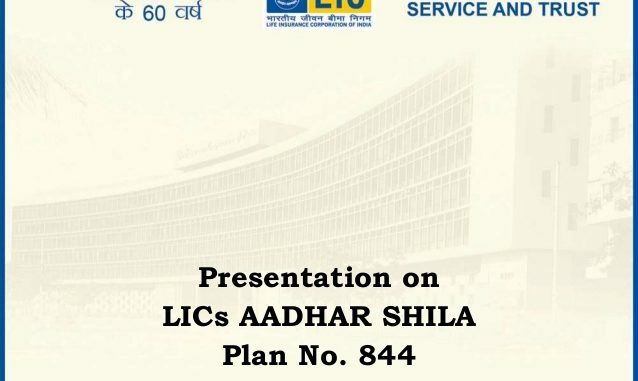 This plan is known as LIC New Aadhar shila Insurance plan No. 844. LIC declares that Aadhaar Shila life insurance policy, this is the exclusively plan for females who have Aadhaar card. In this plan, there will not be any medical test requirement. New Aadhar Shila Insurance Plan is non-linked, with-profits regular premium endowment assurance plan. Let’s discuss more, about this Aadhar Shila Insurance Plan. Exclusively designed for female lives. Aadhar card issued by UIDAI mandatory. Available for standard healthy lives. Maximum sum assured is Rs.3,00,000. Minimum sum assured is Rs.75,000. Maximum policy term is 20 years. Maximum age at entry is 55 years. Mode of payment is yearly, on half yearly, quarterly, and monthly. “Sum Assured on Death” shall be payable on death during the first five years. Before the date of maturity and on death after completion of the 5-year policy, “Sum Assured on Death” plus Loyalty Addition, if any, shall be payable. Wherever “Sum Assured on Death” is defined as the higher of 10 times of annualized premium or absolute amount assured to be paid on death, i.e. 110% of basic sum assured. At the date of death of the life assured, the death benefit will not be less than the 105% of all the premium paid on the policy. LIC New Aadhar Shila Insurance Maturity Benefit: If the Life Assured survives until the end of the policy term and maturity period “Sum Assured on Maturity” plus Loyalty Addition, where“Sum Assured on Maturity” is equal to the basic sum assured if any, shall be payable. LIC’s accident benefit rider is also available as an optional rider by payment of extra premium during the term of the policy. In the in force policy, the LIC’s accident benefit rider can be chosen for at any time within policy term of the base policy provided, the excellent policy term of the base Policy is at least 5 years. If this benefit has preferred for, and if life assured is involved in an accident, leading to death and such incident shall occur within 180 days from the date of an accident then an additional amount equal to the accident benefit sum assured is payable. However, the policy shall have to be in force at the time of accident irrespective of whether or not it is in force at the time of death. Maximum Entry Age : The cover can be chosen for at any time within policy term of the base policy provided, the outstanding policy term of the base policy is at least five years. Maximum cover age : Same as under the base plan. 1. Loan facility is available under this plan, after payment of premiums for at least 3 full years subject to certain conditions. 2. The policy can be surrendered at any time during the policy term provided at least three full years’ premiums have been paid. 3. Under section 10 (u/s10) maturity is tax free. 4. Under section 80 (u/s80) premiums paid can be claimed as a tax. 5. In the case of death due to the accident then accident benefit rider helps to get an additional benefit. 1. In LIC New Aadhar Shila Insurance Policy plan has a low sum assured of a maximum of Rs. 3,00,000 which is very less and would not be satisfactory now. 2. Bank FD’s can fetch your higher returns as compared to loyalty additions, including returns are expected to be very short in the range of 4% to 6.5%. What are Public Provident Fund (PPF) Scheme & its Benefit?